Zagreb, Croatia (AP) — Argentina won their first Davis Cup title on Sunday when Federico Delbonis swept past Ivo Karlovic in straight sets to complete a stunning 3-2 comeback win over Croatia. Delbonis dropped to the ground after his 6-3, 6-4, 6-2 victory. His teammates fell into each other’s arms and celebrated in front of thousands of Argentine fans in the packed Arena Zagreb. 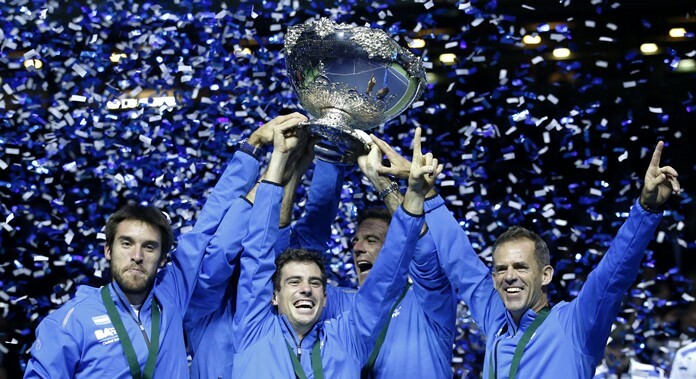 This was the first Davis Cup title for Argentina in the fifth final the nation has played in since 1981. Croatia won in 2005. “Maybe I’ll feel better tomorrow, but tonight it is awful,” he said. The comeback started with Del Potro’s heroics that included a finger injury in the fifth set against Cilic. “I was calm, I hoped all the time that I could win and I did it,” said Del Potro, displaying a bandage on his little finger on his non-racket left hand. “I’m very happy to hand my team a chance of a victory,” Del Potro said. Cilic had a furious start to race to a 3-0 lead including a break in Del Potro’s first service game. The Croat capitalized on the first of three break points with a cracking forehand winner. But then Del Potro, who has recovered after two injury-hit years, showed the form he displayed in beating now top-ranked Andy Murray as Argentina knocked out holders Britain in the semifinals.